It’s probably one of the hottest cooking trends right now, but you may be wondering what can you cook in an air fryer? Is it just for leftovers? How does it work? And again, what can you cook in an air fryer??? Well, don’t worry, I’ve got you covered. And no, this won’t be some super long and lengthy guide to an air-fryer. Short, sweet and to the point. Think of an air-fryer as a combo between a microwave and toaster oven. You get the speed of the microwave with the dry heat cooking of a toaster oven… so basically it produces crispy food super fast. What’s not to love?? Now, I’ll be honest. I didn’t shop around for mine. I went with what Amazon recommended, because that little black “Amazon’s Choice” ribbon dictates a lot of my big life decisions. I got the GoWise XL air-fryer (5.8qt). It has a ton of fancy settings. But just like your microwave settings, who actually uses those?? Ya, I didn’t think so. The term “air fryer” is a bit misleading. Nothing is actually being fried. Anytime you cook something you set the time and temperature, just like an oven. Once the cooking starts, the air fryer circulates super hot air to cook the food. So it’s basically like a super tiny convection oven. Inside the air fryer is a basket that allows for airflow on all sides of the food. Salmon (and other fish): First up is the one that makes everyone’s jaw hit the floor. I got this recipe from my friends over at Fish Fixe. Want to try Fish Fixe? Use code ‘milknhoney’ for $10 off your first box! Meat/Poultry: Follow the same basic instructions as the salmon that I listed above, keeping in mind the relative cooking times of each of the different types of meats. Chicken and pork will need to go a bit longer than salmon, and beef will be dependent on how you like your meat cooked. With higher fat meats, it’s important to line the bottom of the basket with foil before cooking. I always start with thawed meat, though you can start form frozen as well. Frozen veggies: What’s easier than dumping a bag of frozen veggies in the air fryer?? Nothing. Nothing’s easier. Different veggies require different amounts of time, but in general I’ve found that about 2 cups of frozen veggies will cook up nice and crispy and perfect in 10 minutes at 400 degrees. Some recipes for veggies in the air fryer will call for the basket to be lined with foil like I mentioned above. If you want really crispy veggies, I would not do this. Fresh veggies: Fresh veggies are pretty simple. Just cook them at the same temperature but cut the time down some from frozen veggies. Frozen foods: Most frozen foods come with microwave and oven instructions… but not air fryer instructions. I’ve found that most frozen foods do great in the air fryer at 400 degrees, and just cut the recommended oven cooking time listed on the package in half. One of my new favorite frozen foods is Qrunch burgers (pictured here). I cook them in my air fryer on 400 degrees for 6 minutes. Leftovers: Think about the last time you brought home leftovers. How did you reheat them? In the microwave, right? And how did the food turn out? If it was previously crispy, then it probably was a bit soggy. If you want your leftovers to be just like they were the first time you cooked them, use an air fryer!! 400 degrees for 3-5 minutes depending on the food. Example: If I’ve cooked a big batch of veggies in the air fryer on the weekend and am reheating them a few days later, I’ll do it in the air fryer again and not the microwave. 3 minutes later and they’re perfectly crispy again! And that’s pretty much it… As you can tell, the possibilities are endless, and I’ve barely scratched the surface on everything you can cook in an air fryer. 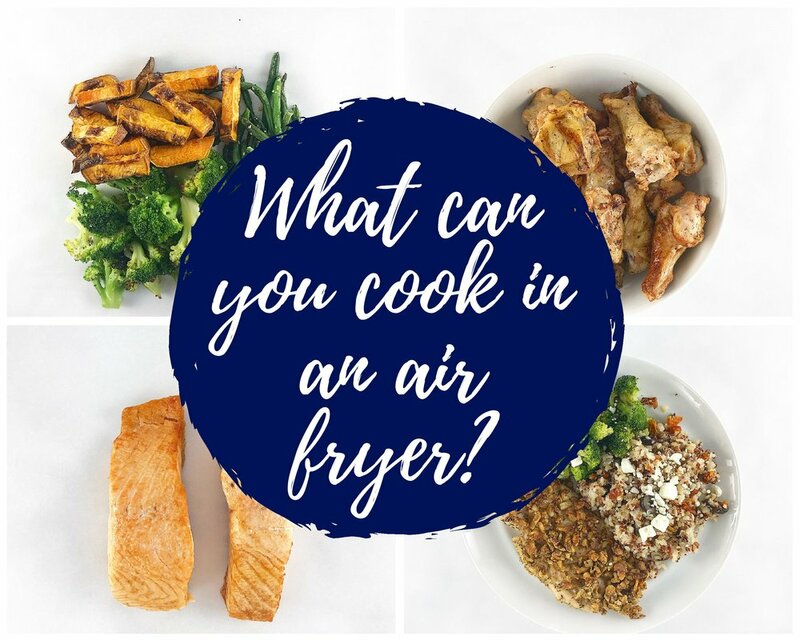 Answer the question, “What can you cook in an air fryer?” in a comment below!